He stays out of the limelight but Richie Murphy has been a key member of Joe Schmidt's backroom team for almost ten years. When Schmidt joined Leinster as head coach ahead of the 2010/11 season, Murphy came on board as skills and kicking coach and has been a mainstay in the Kiwi's coaching staff ever since. 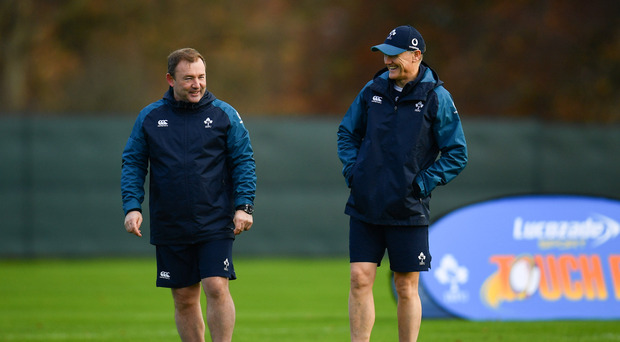 Murphy now holds the role of kicking coach with Ireland has worked with top out-halves such as Johnny Sexton, Joey Carbery and Ian Madigan, and the latter thinks that the Ireland assistant coach has had a big impact on Carbery's development off the tee. After enduring a nightmare outing in Castres last December, Carbery has bounced back to kick 20 out of 20 in four straight wins for Munster, with speculation now growing that the 23-year-old will get the nod ahead of Sexton for at least one of this year's Six Nations fixtures. Madigan credits Murphy with helping him hugely during his time with Leinster and speaking on The Left Wing, Independent.ie's rugby podcast, he said that when he watches Carbery kick now, he sees Murphy's influence. "I think Joey looks very polished and very processed [from the tee]," Madigan said. "For me, every kick he hits now looks very similar. That is down to a lot of the great work Richie Murphy does. I was so lucky to work with Richie for eight or nine years with Leinster. He is the best in the business as far as I'm concerned. He goes through everything with a fine-tooth comb. A lot of what Richie has passed on to me, I can see that he has now passed that on to Joey." Madigan says that a kicker's technique is hugely important in ensuring consistency off the tee, and that Murphy delves into every detail in order to ensure his out-halves are able to deliver in high-pressure situations. "It is simple things, it comes down to maths really," Madigan added. "Ideally when you hit a goal kick you want to be coming in at a 45 degree angle to the ball to the posts. There were times last year when I was watching Joey when I thought maybe he was a bit too far around or maybe he was a bit too square. This year I'm looking at him, and the set-up looks really good. He strikes the ball really pure. At 22, 23, he is well ahead of the curve as a goal kicker."